This book represents a serious and philosophically sophisticated guide to modern American legal theory, demonstrating that legal positivism has been a misunderstood and underappreciated perspective through most of twentieth-century American legal thought. 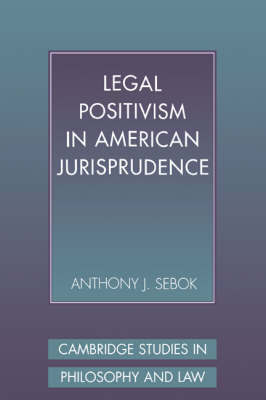 Anthony Sebok traces the roots of positivism through the first half of the twentieth century, and rejects the view that one must adopt some version of natural law theory in order to recognize moral principles in the law. On the contrary, once one corrects for the mistakes of formalism and postwar legal process, one is left with a theory of legal positivism that takes moral principles seriously while avoiding the pitfalls of natural law. The broad scope of this book ensures that it will be read by philosophers of law, historians of law, historians of American intellectual life, and those in political science concerned with public law and administration.